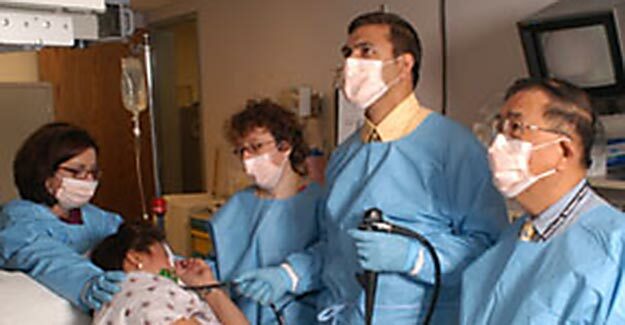 The Gastroenterology and Hepatology Fellowship Program at the University of Missouri-Kansas City is designed to provide expert training in all aspects of clinical and endoscopic gastroenterology and hepatology. Graduates of our program will be expected to excel in both the cognitive and procedural aspects of training in these fields. In addition to a well-rounded curriculum, the second and third year fellow will have the opportunity for mentorship in developing clinical- and/or laboratory-based research. Our goal is to produce a compassionate, well-rounded clinician and academician who is comfortable caring for all types of gastrointestinal diseases. Many of our graduates have entered academic medicine, or proceeded with further specialty training. We are fortunate to have a patient base that runs the gamut from economically advantaged to disadvantaged, elderly to young and includes many different ethnic and racial groups. In essence, our patients are representative of America, and training in Digestive Diseases at our institution is representative of training in America as a whole.